Knee dislocation of any type can be associated with major concomitant vascular injury. Serious vascular injury resulting in ischemia demands prompt recognition and efficient management to prevent devastating long-term sequelae such as ischemic nerve injury, and in the worst-case scenario, major amputation. 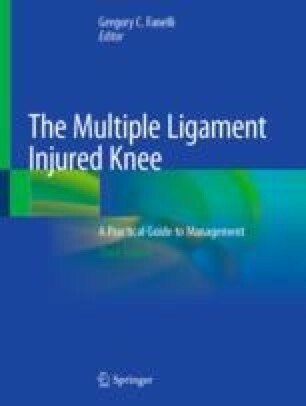 In this chapter, the mechanism by which knee dislocation results in popliteal vascular injury will be reviewed. Physical exam findings indicative of vascular injury will be described. Diagnostic modalities used to evaluate the extent of vascular injury will be individually discussed. Appropriate initial management of vascular injuries is crucial, and an algorithm for diagnosis and management will be reviewed. Finally, the salient points of vascular reconstruction in the context of the dislocated knee including surgical approach, conduct of the procedure, and adjunctive maneuvers will be discussed.